Follow me on Twitter & like me on FaceBook. Saturday - April 30, 2011: We began the day with a drive to Osawatomie, Kansas to photograph another waterfall. This one is formed by an overflow dam on the Marais des Cygnes River on the north side of town. Although I think it may be a bit more attractive when the water flow is lower, this is one of the less attractive man made waterfalls that I have seen in Kansas. The waterfall might not even merit a page on this web site, except it is just above the 1930 Creamery Bridge, a Maple Arch bridge which has a rainbow span 140 feet in the air at its highest point. There are only eight triple span Maple Arch bridges remaining in the state of Kansas. Two of those are in Osawatomie and they are both on the National Register of Historic Places. There are also some magnificent cottonwood trees on the bank of the Marais des Cygnes River near the Osawatomie Dam. The cottonwood tree is the Kansas state tree, but most of the largest Cottonwoods have been cut down over the years and the remaining large cottonwoods have become landmarks. We drove southwest of Osawatomie to the much smaller community of Lane which has another overflow dam falls. The dam is located on the Pottawatomie River, right below the Kansas Avenue Bridge. This dam wasn't attractive at all. Before leaving Lane, we stopped at the Lane Post Office and purchased 100 forever stamps. The Kansas Sampler Foundation urges Explorers to purchase stamps from rural post offices to help them stay in business. Lane still has some interesting buildings on its one block long main street, as well as other interesting features such as a hitching post that is being regularly used, and a street clock which I have been unable to learn more about online. Driving back along 379th Street, we stopped to investigate a cemetery and church which had caught our eye on the drive to Lane. The oldest parts of the present Spring Grove Friends Church were built in 1877, replacing a smaller structure which had been erected in 1860. The adjacent Spring Grove Friends Cemetery was also established in 1860, although the oldest headstones we could find and read were from burials in 1870. We drove back through Osawatomie and on to Paola to have lunch at Beethoven's Restaurant. I hadn't been to Beethoven's since last summer and really need to get back to this German restaurant more often. I particularly enjoyed the $8.95 sausage sampler which included bratwurst, weisswurst, nuernberger bratwurst and knackwurst served with sauerkraut and German mustard. The sauerkraut was sweet and we both thought it was some of the best sauerkraut we had ever had. It was best when the mustard, sauerkraut and sausage were combined in the same bite. As always, we took home some of the huge chocolate chip cookies and snickerdoodles. This was the one year anniversary of our engagement at the Eiffel Tower in Paris and we celebrated with supper at Aixois French Restaurant & Coffee Bar in Kansas City, Missouri. The restaurant is located between the Brookside and Country Club neighborhoods and was quite busy. I liked Aixois, but it was more loud than romantic and wasn't what I was looking for to celebrate our anniversary. The food and service were good, with one major error. We were in the restaurant for well over an hour before the waitress came to our table and said that they were out of the veal liver which I had ordered. The server and manager both apologized and they compensated us with a dessert for Linda and a glass of Calvados for me. Friday - April 29, 2011: I had lunch at Go Chicken Go in Olathe, Kansas. I hadn't been to the fast food restaurant in nearly a year. The deep fried gizzards with the hot "G sauce" are as good as ever and a half order is a lot of meat. I also tried the new $3.99 chicken wrap. It was a deep fried chicken tender with just a little bit of lettuce and shredded cheese and the choice of 3 sauces. I think it needs something more. The next stop was across the street at 7 acre Olathe Veterans Memorial Park. I have driven past the park dozens of times, but never seen anyone in the park. When I pulled into the parking lot, it was half full, but there was no one in the park - I think the employees of nearby businesses use the lot. Olathe Veterans Memorial Park is really a lovely memorial park, but it is a shame it was stuck on this location where there is no nearby foot traffic. Other than the memorials there is no reason for someone to drive to this location. If it was near the downtown, I believe there would be people using the park each lunch hour. The neatest individual memorial may be the Four Chaplains Memorial, which was dedicated to 4 chaplains from the American troop transport ship, Dorchester, which sank near Greenland in WW2. As it sank, the chaplains brought order, directing the soldiers and loading them into life rafts. When life jackets were gone, they removed their own life jackets and placed them on other men. They went down with the ship. I went on to take more photos of Cedar Creek Falls, this time in sunshine, and added a page devoted to the waterfall in the evening. At supper we tried a restaurant which was new to us - El Porton Cafe in Overland Park. The 52 seat restaurant serves authentic South American and Caribbean cuisine. The service was friendly, answering questions and offering opinions where they were asked for. The menu had a whole section devoted to arepas, which are a venezuelan dish made of ground corn dough or cooked corn flour. We tried the $5 carne mechada arepa which was filled with shredded beef. I liked it, but would not hurry to have it again. The arepa bread was quite dense, reminding me of pupusas from Salvador. Linda had the camarones al ajillo, which were fairly straight forward shrimp with garlic sauce and butter. They were served with rice and sweet plantains for $14. I was hoping for a steak smothered with garlic like I have had at Latin restaurants in Florida, but El Porton offers nothing like that. I settled for the bistec encebollado, which was a steak smothered with caramelized onion and served with rice, beans and plantains for $12.95. My favorite part of the meal was a side salad which came out with the entree and was not listed on the menu. I would have liked the servings to be a bit larger. Thursday - April 28, 2011: Finally having a sunny day, I photographed the Cedar Lake Falls in the spillway just below the Cedar Lake dam in Olathe, Kansas. It is the second of four waterfalls which were pointed out by Randy Rasa of kansascyclist.com. It takes a little effort to get to the bottom of the falls, but I think it is worth the effort. Added a new page Cedar Lake Falls this evening. It is the 33rd waterfall on the Kansas Waterfalls Page. For supper, we tried a new organic burger joint in the Kansas City area. The Snak Shack on Santa Fe in downtown Overland Park. The Snak Shack opened as the Shake Shack in 2010, but after repeated threats of a lawsuit from a small fast food chain in the eastern US, changed its name. Since the signs were already made, the cut the the top off the "h" and removed the "e" so "shake" became "snak." I hope that some obscure Snak Shack doesn't become overly aggressive with them. The tiny restaurant has only counter seating for about 12, but there are also picnic tables outside. The menu is very limited: burgers, hot dogs, grilled cheese sandwich a veggie sandwich, onion rings, fries, and very simple shakes or floats. But the items we tried were very good: single cheese burger, Bobby Burger, onion rings and a chocolate shake. They offer three flavors of hand dipped shakes and were out of vanilla and strawberry. The $5 single burger is a third pound. The $6.95 Bobby Burger has two 1/3 pound patties, three slices of cheese, grilled onions and jalapenos. I would have liked it cooked a little less well done, but it really was a good burger. The hand made onion rings looked a touch overcooked, but they tasted great! Wednesday - April 27, 2011: I made my fourth visit to the new Burnt End BBQ in Overland Park for lunch today. We ordered at the counter. When our food was brought to the table, the young man dropped one of my wife's ribs on me. It caught between my arm and chest. He sat down the plates, then used a paper towel to pick up the rib. He looked at the rib, then at my wife's plate and hesitated, finally saying he would bring a wash cloth and another rib. Fortunately, I was wearing a leather jacket and it cleaned OK. The sauce that landed on my shirt washed out easily. But we never really received an apology and he didn't bring another rib. When the cashier picked up our plates just before we left, she asked how things as been. My wife said that she had never been brought the replacement rib and that one of the ribs that made to the table had been very cold and was not eaten. The cashier offered to bring another rib then, but we said it was too late. She gave a quick mumbled sorry as she walked away. I sent an email about the experience to PB&J Restaurants, but as of three days later when this is being written, PB&J Restaurants didn't respond. I went to supper at Flavor of India in Lenexa, Kansas. I have thoroughly enjoyed the lunch buffet at Flavor of India, but this was my first time ordering off the menu. When I sat down, the server brought a basket of Puppodums, wafer thin crisps made from lentil flour, and an assortment of chutneys. After considering the options and trying to select one that wouldn't include too many carbohydrates, I ordered the $14.95 Tandoori mixed grill. Tandoori cooking is usually done very quickly in an extremely hot Tandoori oven, so I was surprised when the food took about 30 minutes. The mixed grill came with a large bowl of steamed rice and a sauce on the side. The chicken could have been cooked just a bit longer, but tasted every bit as good as it does on their buffet. There was only one shrimp, but it was large and had a great flavor. The seekh kabob, malai kabab and lamb boti kabab were a bit tough. When I have had the Tandoori mixed grill at other Indian restaurants, there has been a wonderful mixing of of the juices from the various meats, but these meats didn't seem to have much juice. I was very disappointed to discover today that Ari's Greek Restaurant in Olathe, Kansas has closed. Tuesday - April 26, 2011: We tried a new restaurant tonight, Cronin's Bar & Grill, which open in Lenexa about 3 months ago. The bar is a little sterile right now, I would like to see a little more decoration. The service was good, the kitchen was slow, the food was average and the prices were very good. A third pound bacon cheeseburger with a big order of fries was $6.95. The beverages and fries were very reasonable. Soda and most sides were $1.50. A large side salad was $1.25. I don't think we will become regulars, but we will be back. Monday - April 25, 2011: I visited a new (to me) waterfall in southwest Olathe, on the Cedar River, just above Lake Olathe. It was recommended by Randy Rasa who has the Kansas Cyclist web site. On the way to the falls, I saw that Johnny's BBQ had raised its price on the weekly rib special and stopped in on the way back to see what other changes had been made. Most dishes have gone up 30 - 50 cents, and I have updated the Johnny's BBQ web site with the new menu. I had the chicken, which is first smoked, than finished in the deep fryer. It is best without sauce, but you must request it that way. The chili is also good. It is meaty & thick and would make a good chili dog. Sunday - April 24, 2011: Four of us went to dinner at Paulo and Bill, an upscale Italian Restaurant in Shawnee, Kansas. We started with an order of the $8.95 garlic bread bruschetta. The lightly toasted bread was very good and everyone enjoyed adding their own toppings from the goat cheese, caramelized onions, sun dried tomato kalamata olive tapenade and roasted red peppers. Three of the main dishes were big hits. They were the $13.95 grilled chicken salad with mixed greens tossed in a pomegranate vinaigrette with apple, pears, goat cheese and spiced pecans; $26.95 6 ounce beef tenderloin medallions stuffed with Maytag bleu cheese finished with a chianti demi-glace & served with roasted new potatoes and asparagus; and my favorite - the $23.95 veal marsala sautéed with a Marsala wine sauce and served with crimini mushrooms and mashed potatoes. The combination of the veal, wine sauce and mushrooms was perfect. Added a new page devoted to Lyons Twin Mansions Bed & Breakfast and Spa in Fort Scott. Saturday - April 23, 2011: Today's lunch was at Andre's Rivaz Tearoom in Overland Park, Kansas. It had been a couple of years since the last time I went to Andre's Rivaz Tearoom. Nothing has changed, but that is a good thing. The all inclusive menu is limited to a couple daily specials, cheese pie and Quiche Lorraine served with coffee or tea and a wonderful choice of dessert for $13.76. Today I had brisket with a mushroom sauce that (surprise:-) reminded me of swiss steak. I was a bit disappointed with it at first, but after a bit of salt it tasted so good I was tempted to lick the plate. The polenta and salad that it came with the brisket were also good. Though I was less impressed with the beats and chilled bean salad that came with it, the Quiche Lorraine was even better. The meat and cheese in the quiche were exquisite. At the conclusion of the meal, the server brought a tray of pastries. Linda selected a chocolate cake which she thoroughly enjoyed. While I selected a bunny shaped white cake that was wonderfully rich but light. Friday - April 22, 2011: A group of us went to Café Augusta in Overland Park. We were a little disappointed to discover there was a band playing, but we selected a table at the far end of the room. My bacon wrapped fillet was the best dish I have ever had there. Updated the reviews of the Castle Rock Badlands and the Oz Museum. 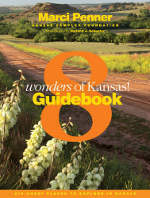 The new 8 Wonders of Kansas Guidebook came in the mail. The size of a coffee table book, it is filled with fabulous photos, but it is soft cover to carry along on your travels. The Kansas Sampler Foundation has details about ordering and a list of places where it can be purchased. Thursday - April 21, 2011: We had lunch today at Café Nordstrom in the Nordstrom department store in Oak Park Mall. The upscale cafeteria really does serve good food and provides excellent service. We had the $11.95 Tuscan roasted salmon and $10.95 Tuscan roasted chicken. Each was seasoned with rosemary & garlic and served with Yukon gold potatoes, carrot, sweet pepper and zucchini. Updated the page devoted to the Oak Park Mall. Wednesday - April 20, 2011: I had lunch at Mai Thai restaurant which opened last Friday in Overland Park. The attractive modern restaurant is fairly large, occupying two storefronts. The hot and sour soup had more ingredients than most hot and sour soups, but didn't have much flavor. The red curry was not "hot" as ordered but was still pretty good. I requested the spicy tray and pepped it up with Thai peppers in fish sauce. The lunch combination (which also included steamed rice and two tiny crab Rangoon's) was $8.95. Tuesday - April 19, 2011: We revisited KC Grill & Kabob for lunch. There were some dishes on the buffet today which we hadn't seen before and I didn't care quite as much for them as the ones which they replaced. Even the nan bread (which has been so good the last couple of years) was denser and we did not like it as well. Supper was a second visit to The Pick Smoke n' Grill in far western Shawnee, Kansas. We first dined at this restaurant last July, a few weeks after it opened. It has little changed. The meats are the strong part of the meal. The best was the grilled salmon which was well seasoned and well grilled. I had the combo platter which had a large serving of brisket, pork and pork ribs. All three had good flavor from the smoking, though the ribs were a little tough. The sides were a bit small and the only one which I really liked was the onion rings. The coleslaw had almost no dressing and was like eating chopped cabbage. The beans were mushy and had no flavor other than being a bit sweet. With no appetizers or desserts, and sodas to drink, the tab for two of us seemed high at $45 including tax. Sunday - April 17, 2011: Top Chef The Tour came to Kansas City, Missouri today - the second stop on its 2011 tour. There were 4 performances and we attended the final competition of the day. It featured former Top Chef contestants Nikki Cascone (Season Four) and Hector Santiago (Season Six). The competition took place in a canopied seating area at the City Market. There was seating for just 50 people and we snagged seats in the front row. Before the competition began, they asked trivia questions about previous season of Top Chef. My step daughter answered the first question and became one of the three judges of the competition. The secret item had been selected by voting on Facebook for Kansas City was beef. The two chefs cooked at stations flanking the judges, where the audience had equally good views of both chefs. A host talked about the tour and took questions from the audience for the Chefs. At the end of the cooking, the judges were served the food the chefs had prepared, while the audience had samples of dishes made by other chefs (in the back) to the same recipes. Nikki Cascone won this round with the top vote of 2 of the 3 judges. Added a new review of Rock Creek Lake Waterfall in Fort Scott. Having missed seeing Celina Tio at the Top Chef Tour, we went to Julian in Kansas City for supper. On Sunday evenings, there is no menu, rather there is a theme and guests order 3 courses for $30 or 4 courses for $35. They are asked if they have allergies or dislikes, but the dishes come as a surprise. Tonight's theme was seafood. The first course was radish, mussels and house made butter on crusty bread. The New England clam chowder was my favorite - the wine broth was exquisite. The main course was sautéed trout with wild rice and fava beans. The trout was very good, particularly the skin. Our server asked if we wanted more of anything and brought us more trout. The dessert was a pudding with pineapple and banana. It was my least favorite part of the meal. One of our party does not like puddings at all and they brought her a very nice praline turtle cheesecake. As we left Julian, Chef Hector Santiago was dining on the patio. Saturday - April 16, 2011: Today, we drove to Fort Scott, Kansas where a friend joined us for lunch at Lyons Twin Mansions Bed & Breakfast and Spa. Lyon's now serves breakfast and lunch daily from 6AM - 2PM. The dining rooms are all decorated with an Alice in Wonderland theme for the spring. The menu is somewhat limited and many items (including 4 which we tried to order) were not available. But the food is good and the servings are quite generous for a tea room. We started with Buffalo chicken chunks and blue cheese. The menu says the $4.50 appetizer serves 2, but it was a generous serving for 3 of us. We also had pasta scampi, chicken salad, Ceasar salad, and the focaccia club sandwich. The club sandwich was over 4 inches thick! My favorite things were the herbed focaccia bread and Ceasar salad. Following a tour of the grounds and the two mansions, we drove west to Rock Creek Lake. The spillway at the northwest corner of the lake has a lovely series of waterfalls. It had rained last night and the water had jumped the river bank, going around trees that usually are out of the water. This is another fine Kansas waterfall with no signs or mention by the community. For supper, we went to Werner's Specialty Foods in Mission, Kansas. We were planning on by sausages that had been grilled outside the store, but the grill shut down at 2;30PM. So we bought bratwurst, cheddar bier, and smoked Italian sausages to take home and grill. We also selected a couple of spicy mustards and pickles from Werner's selection of German and Scandinavian foods. Added a review of the New York Dawg Pound in Overland Park, Kansas. Friday - April 15, 2011: We returned to RJ's Bob-Be-Que Shack for the first time since it appeared on Diners, Drive-ins and Dives last summer. The BBQ pork ribs and cheesy corn were very good and the fries were about as good as frozen fries can get. The sausage was thin slices of larger sausage, much like Arthur Bryant's, but I really don't care much for the sausage either place. Thursday - April 14, 2011: I saw a sign saying "Mai Thai restaurant" on 135th Street in Overland Park earlier in the week and drove over to check it out at noon today. It turned out that the restaurant wasn't open yet, but they were were cleaning and the signs said that they will open Friday, the 15th. Still in the mood to Thai food, I made my second visit to Tasty Thai at 143rd & Metcalf in Overland Park. THe food is reasonably priced but only so-so. The dishes I had today made me think of food court dishes. The $6.95 ginger chicken was fairly good, but the $7.95 Thai Buffalo Wings were a bust. They were not at all crispy (as they were described) and the sauce didn't work well with the chicken. The sauce was a little better when just eaten with the vegetables and cashews. Supper was a revisit of Grandstand Burgers in far north Overland Park. Grandstand Burgers has only 4 stools at a tiny counter, plus some picnic tables out front. I do like the food at this restaurant, but wish I had remembered to ask for the burger to only be cooked to 168 degrees. It was overcooked for my taste. The cashier asked why I was taking pictures and I explained that I had already reviewed them online, but need to find out if things had changed in the past 9 months. The onion rings are very good for previously frozen rings. Wednesday - April 13, 2011: Had my second meal at the New York Dawg House in Overland Park. I have decided that the key to appreciating the Dawg House is to have the house original hot dogs. The Chicago style dog and chili dogs which I had in the past were disappointing, but I was much happier with the two dogs which I tried tonight. Ol' Blue was my favorite. It is called "Kansas City Style" and is topped with BBQ sauce, pickle and onion straws. The Spike ("New York Style") has sauerkraut, onions in sauce and spicy mustard. These dogs were just $3.50 each. On the next visit, I want to try the Goofy Dawg with peanut butter and bacon. Tuesday - April 12, 2011: Revisited The Burger Joint on Merriam Lane in Kansas City, Kansas. About the only thing that has changed sine 2009 is that they have added a ramp where there was a dangerous unexpected step in the dining room. They were out of chili, but I had a decent hand formed cheeseburger. The onion rings at the Burger Joint are frozen and not made in house, but are locally made and are still pretty good. Monday - April 11, 2011: We stayed overnight in Saginaw, Michigan and made one more stop before returning our rental car in Detroit - at Zingerman's Deli in Ann Arbor. Zingerman's came highly recommended and I am delighted to say it lived up to it. The crowded little delicatessen had counters with great meats, many cheeses and a host of baked goods from their own bakery. We placed our orders and moved to the building next door to wait for our food to be brought to us. I splurged on the Manhattan Fish Platter (A chunk of whitefish, sliced Maine Smoked Salmon, smoked trout salad & hot smoked salmon accompanied by red onions, tomatoes, capers & a toasted sesame bagel from the Bakehouse). It was a very nice meal. The only problem with Zingerman's is there were too many good options. We all want to return and try other dishes. Updated and expanded the page about Lake Scott State Park in western Kansas. The lush park is an amazing contrast to the high plains that surrounds it. Sunday - April 10, 2011: This was a very foggy day. The fog only lifted enough for this photo about 9:30AM and by 10:30 it was back and we could see less than a block. In the afternoon we drove across the Mackinac Bridge to the Kewadin Casino in St. Ignace. It was the first time I had been to the casino since they moved into their new building. It appears that there would be a nice view of the lakeshore, but with the fog, I really couldn't tell. Our group had a good time and over all, were ahead of the casino for the visit, but I found the cigarette smoke to be a problem. When I found the block of video poker machines which I really wanted to play, the smoke made me too nauseous to stay at them. Lunch was at the Driftwood Restaurant in St. Ignace. We kicked it off with a whitefish spread and whitefish bites. I had a meal of mixed fried perch and whitefish. It was a pleasant meal. With a flight back to Kansas City the next day, we headed south about 5:30 PM. The fog lifted within a few miles of Mackinaw. For supper we stopped at Spike's Keg 'O' Nails in Gaylord - a 78 year old family oriented tavern and restaurant. We had a burger, BLT and fried smelt. All of the food was good. The sweet potato fries were the biggest hit. Saturday - April 10, 2011: Lunch was fried perch at Dixie Saloon in Mackinaw City. A few years ago, the Dixie was doing a pretty good job, but I have been much less pleased with the food during more recent visits. The baked whitefish spread appetizer was fairly good, but it came from the fishery that way and just had to go in the oven. The perch was actually tough, not nearly as good as I had the evening before. Mom's memorial service was just a couple of blocks away at the Church of the Straits - the church which I grew up in. For supper, 8 of us drove down to Levering, to the Levering Cafe. The Levering Cafe serves large servings of good food at a very reasonable price. We had good whitefish, broasted chicken, smothered chicken & my father had breakfast. Most of us had more food than we could eat and the meal only came to $82 with tip! I am really impressed with this place! This evening I expanded and upgraded the pages devoted to Straits of Mackinac Lighthouses. Friday - April 9, 2011: Linda, Jesi and I are off to northern Michigan for a memorial service for my mother who passed away in November. We flew into Detroit to rent a car and drive north nearly 300 miles to Mackinaw City. We arrived about 7PM and the first thing we did was pull around to the shore show I could show Jesi "my" bridge and snap a couple of quick shots for our sister web site www.mightymac.org. After checking in to the Holiday Inn Express (which I am happy to recommend) we had supper at the Key Hole Bar. Tonight's meal was fried perch. I had perch, whitefish or smelt for every meal this trip, but the perch at the Key Hole was the best of the weekend. Thursday - April 7, 2011: This evening I attended the Lenexa Chamber of Commerce Business After Hours event at Meritex Enterprises. The Meritex Lenexa Executive Park has 3 million square feet of subsurface warehouse space. The warehouse is enormous - the drive to the area set up for the Chamber event was a half mile. The reception was an opportunity for various warehouse clients to talk about their businesses. Those clients include the Federal Records Centers of the National Archives and Records Administration, the Office of Trust Records for the Special Trustee for American Indians, and Bushnell. It was also an opportunity for the EPA to award the Meritex facility with the Energy Star rating. Added a new review of the Lake Afton Public Observatory in Goddard, Kansas. Wednesday - April 6, 2011: Added a new Facebook Page for our sister web site www.mightymac.org. I am watching Top Chef Masters on Bravo. The new series started tonight and one of the celebrity contestants is Chef Selling Tio from Kansas City, Missouri. I have enjoyed her food at James Beard Dinner, years ago at the American Restaurant in Kansas City and most recently at Julian in the Brookside neighborhood of Kansas City. Monday - April 4, 2011: Added a new review of Karg Art Class Gallery in Kiche, Kansas. Sunday - April 3, 2011: Returned to Nick and Jake's, a restaurant & bar in Overland Park, Kansas, I went there intending to try the Sunday brunch, but after looking at the buffet, I decided it was a little too limited and uninteresting for the $17 charge. We each ordered off the menu instead. LInda had the $10 Firecracker Chicken Salad - greens, jack & cheddar cheese, bacon, tomatoes, croutons, celery, blue cheese dressing & crumbles, and fried chicken tender meat in a Buffalo sauce. It was a good salad, but I think it would have been much better if the chicken had been hot instead of cold. My $14 baby back ribs with a dark, sweet BBQ sauce were better. They came with a good sweet creamy coleslaw and very good fries. Saturday - April 2, 2011: Added a new page devoted to the Drury Dam waterfall, near Caldwell, Kansas, which I visited last weekend. Today we revisited places in Lawrence and Kansas City, Kansas. Lunch was at Biemer's BBQ in Lawrence. Biemer's open in 2007 in a space which has previously housed Sandy's Thrift 'n Swift and Bucky's Hamburgers. We tried the chicken wings, pork ribs, sausage, and beef brisket. All of the meats were good, but not so good that they stand out in a city with as many great locally owned restaurants as Lawrence has. Though not made from scratch, the onion rings and fried pickles were our favorite sides. The coleslaw and baked beans were good, but we had enjoyed them more during our first meal at Biemer's last year. The servings were all quite generous. Driving across Lawrence to the University of Kansas, we went to the Helen Foresman Spencer Museum of Art. The Spencer Museum has a much larger selection that it can exhibit and much of the permanent display had changed since my last visit. The large 20/21 Gallery has some of my favorite art in the museum, but I wish the art had labels in this gallery. We walked short distance and climbed Oread hill to the Natural History Museum, with a short stop across the street to photograph the The Bedazzler by Patrick Dougherty. The 24' by 20' cylindrical sculpture is made of saplings gathered at Clinton Lake and then woven around an elm tree. The Bedazzler was constructed in 2009 and will decompose to the point where it will be mulched sometime in the next year or so. I was disappointed to learn that about a quarter of Natural History Museum is closed for renovation. The person at the front desk said that the work is going slowly and she wasn't sure when the top floor of the museum would reopen. The closed section includes the live exhibits of snakes, mounted individual mammals & birds and the popular living bee hive. I was surprised to learn about the connection between the Natural History Museum and the 1893 Chicago World Fair. The main floor of the Natural History Museum is largely taken up with a diorama with several multiple environmental habitats and mounted animals which were prepared by the University of Kansas professor Lewis Lindsay Dyche for the 1893 Chicago World's Fair. The lovely limestone building housing the KU Natural History Museum was built to be the permanent home of the collection in 1903. Supper was at Mad Jack's Fresh Fish in Kansas City, Kansas. The crowded little fish hut sells both cooked and fresh seafood. We enjoyed the red snapper, frog legs and fried oysters. Mad Jack's is great for what it is! Friday - April 1, 2011: We revisited Anthony's Diner, the two year old Italian restaurant in Eudora, Kansas for supper. Tonight we tried the Italian steak parmesan and chicken spiedini. These meals are extremely reasonable. With bread, a large salad and pasta, they were only $8 & $9. The salads were just mixed greens and croutons, but were good salads. the steak with its sweet tomato sauce was very good, though the same sauce didn't work as well on the spaghetti. The chicken spiedini was different than I have seen before, sautéed chicken tenders rather than the grill skewers I have had other places. I thought the first couple of tenders were good, but then added some parmesan to the third piece and discovered that made the chicken extremely good. I like the people that work here, but they were off their game tonight. It took about 40 minutes for Linda's entree to come. Mine took another 10 minutes and I still had to ask about the Italian sausage side ($1.50) I had ordered. It took about 5 minutes. That sausage was quite sweet. It was fine, but I would have liked a spicy sausage better.